Making your web site and landing page mobile responsive. Being mobile responsive: chances are half or more of your customers are visiting your web site or landing page from their mobile devices such as phones and tablets across all these platforms: Apple’s iOS, Google’s Android, and Microsoft’s Windows Phone system. It has become absolutely a must to ensure that your site or page is 100% mobile friendly and responsive, in terms of download speed and rendering. Often a web site or landing page needs to be customized to show the content on mobile devices correctly. 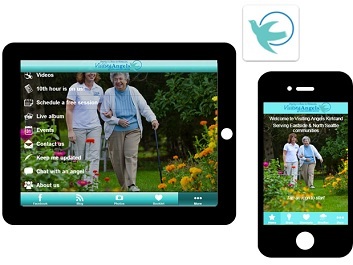 Needing a mobile app: if your business’s goal is to grow a customer community such as a members and guests of a tennis club or seniors and caregivers from a senior care service, you may consider creating your own branded mobile app that runs perfectly on all these mobile platforms. Comparing to your mobile-friendly web site, a stand-alone mobile app does more than a mobile site. For one – your branded up shows on your community members’ phone and tablet screens. For two, location-based services are built-in features in your mobile app, including navigation, click-to-call, current weather, etc. Also, with a mobile app in place, you can also push messages directly to community members’ mobile devices to show on their screens (called “push notification”). Imagine you have a instant special that you want to let members know – what will be a better way other than pushing it to their phones? We have found that customers are more likely to contact a business such as by calling directly from the branded mobile app. Browse these projects to get started. A FanZappy principal will be working with you on mobile marketing strategy for your business.